Coffee tables are great for setting a drink down, but not really worth it if you don’t have the floor space. The best way to gain table space without taking up any room is with a skinny sofa table like this one over at Always Never Done (full tutorial there). Not only does it add visual interest and charm to this living area with the addition of lamps and decorations, but it’s also a convenient place to set down a glass of wine! Even better, check out this sofa table with a built-in outlet tutorial from Turtles & Tails! This not only provides extra shelf space, but also makes the outlet easy to access for charging your phone or laptop. Pretty darn creative! For siblings that share a room, consider using curtains to separate their space while still leaving a nice open feel. This also looks nice in a studio apartment to separate the living area from the bed. This is an easy room divider solution, especially if you can’t do any construction as a renter. You can purchase these in 8-9ft tall lengths on Amazon, but the ceiling mount hardware comes separately. Use the space behind your pantry door to store all of your small pantry goodies like spices, foil, and plastic wrap. I’ve seen this done with something as simple as a hanging door shoe rack, but I love this DIY kitchen organizer and spice rack because it looks so much nicer! It really looks like it was an original addition to the pantry. 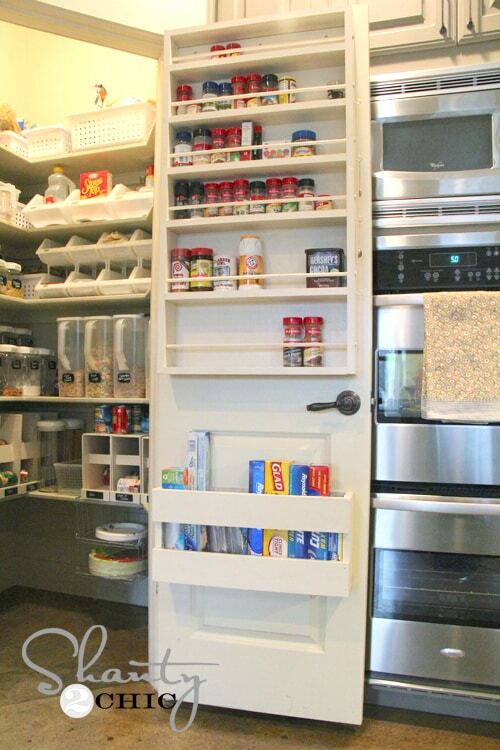 Utilize the space behind your pantry door for convenient extra storage. View the entire list of Small Space Hacks.